“Die Alpen” was drawn with coloured crayons in multiple sections on transparencies. Where possible, rivers served as the borders of the different pieces, which were later combined into one large sheet approximately 90 × 63 cm. Kümmerly+Frey used this coloured relief shading for different thematic maps. 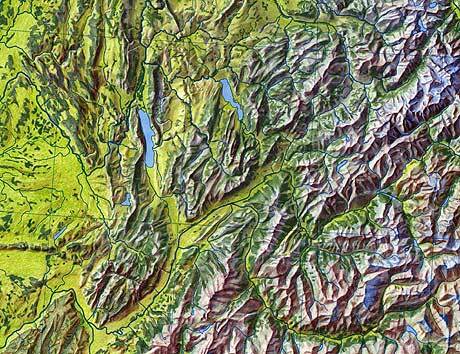 “Die Alpen” (section) by Kümmerly+Frey, Bern, original scale 1:750,000.